Jkuat fall to Strathmore – Kenyatta University TV (KUTV). All Rights Reserved. 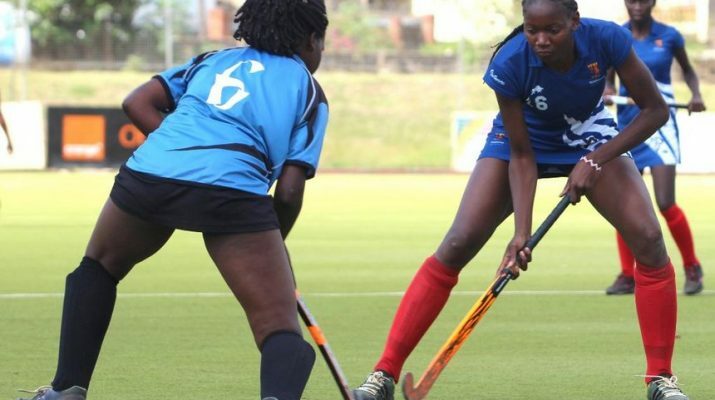 Strathmore University rallied from a goal down to sink fellow students JKUATS 3-1 in the women’s Kenya Hockey Union (KHU) Premier League match at City park. After a poor start in the opening quarter of the first half, JKUATS took advantage of poor marking by Strath to score their opener and lone goal in the 12th minute through Slyvia Makumi. JKUATS dominated in the first half, causing all sorts of problems to Stratus backline but they remained solid, thwarting all attempts to double the lead. Meshack Senge’s charges replied in the 21st minute to level matters in a well taken field goal delivered by Virginia Wanyee. Two minutes later, Gilly Okumu who produced a man of the match display, doubled Strath’s lead through a field goal to give her side a deserved lead at the breather. JKUATS will have themselves to blame for squandering a handful of scoring chance in the first half. A different Strath resumed in the second half, out-playing and subduing their opponents. Their efforts paid off in the 40th minute as Ruth Odhiambo tapped in Gilly Okumu’s cross to score their third goal. Minutes later, Lorraine Muturi was denied by the post after beating the back line. The win saw Strath ascend to position two with 23 points, leapfrogging USIU who were not in action over the weekend. Earlier on at the same venue, Vikings thumped a visiting Mombasa Sports Club 3-0 to hit their 15th point. Vikings got their goals through Winnie Ivayo in the 24th minute, Lilian Ndukuyu (33rd minute) and Doreen Otieno (59th). Clyde Mmbaha attributed the success of his charges to team work and relentless fight.